She led a social revolution against sexual and racial barriers - now she tackles the barriers within ourselves. 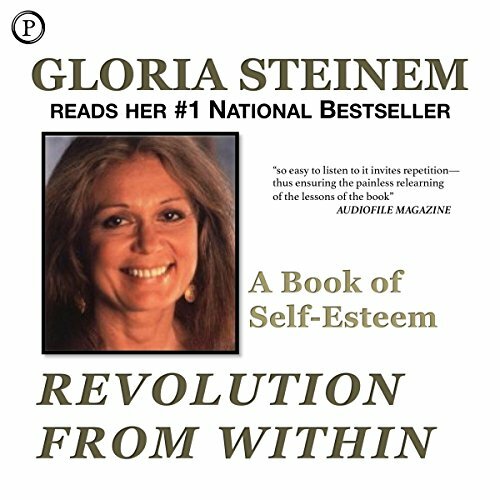 In this unique work writer and activist Gloria Steinem discusses the meaning of self-esteem - in the U.S. and around the world - using personal experiences and parables from the lives of people as diverse as Gandhi, Julie Andrews, and kids from Spanish Harlem. She underlines the importance of "un-learning" and disrespecting educations that disrespected us, while offering practical ways of voyaging inward to learn from the unique knowledge within each of us. Finally, Steinem takes us on a journey through nature, spirituality, and newly discovered capacities of the human brain to show that, with improved self-esteem, anything is possible. Its only 4 chapters! at the end, I was like Whoa, whats going on???? Too short. Five stars for content, but I'm feeling a bit deceived and gyped. Do not get this audiobook and instead get the book. The book is great and I highly recommend it. However this audiobook only covers 4 chapters and this was not mentioned anywhere. It's too bad since Gloria is also a great narrated. Love the book, love the experience of hearing author read. This is my first experience with audible.com. This version only covers the first 4 chapters (or about half) of the book, so it is NOT an abridged full version. The description is quite misleading. I had hoped to cover the main points of the book in the 3-hour playtime, but instead am reading the paperback to get the content. With both wisdom and humility, Gloria Steinem shares her personal experiences with self-esteem juxtaposed against the research of other experts. This audiobook is like a long lunch with a kind, wise friend. I'm just discovering Gloria Steinem and she is one forward thinking woman. This book is well written and I would recommend it to any woman/man of any age. It helped me put myself on the path to self discovery. Thank you, Gloria Steinem! Her writing never fails to amaze and inspire me. I couldn't stop listening, it was so good, like all her books are. You won't be sorry you read it. Just an amazing voice and vision for wellness and feminism! Great if you need help with self esteem. It's the 1st selfhelp book that isn't just focused on the inside, of course the outside counts in the building of oneself! It has become one of my favorite books!